In a blow to the hopes of passing immigration reform anytime soon, the bipartisan House “gang of seven” plan is probably dead, and almost certainly won’t be introduced this fall as promised, a top Democrat on the “gang” acknowledges. Sakuma Berry Workers Need Your Help NOW! The workers at Sakuma Berry Farms north of Seattle are on strike - the fourth strike against the company this season. The company has gone back on its promises of wage increases, and fired Ramon Torres, the leader of the workers' organization, Familias Unidas para la Justicia. Boycott picketlines have gone up at the company's processing plant, and in front of stores in Seattle. Now the company may be moving security guards into the labor camp where the strikers live. The workers need your help now. Sit down and negotiate with the workers. Stop harassing workers in the labor camp. Guarantee the jobs of the striking workers, this season and next. Sakuma sells a lot of strawberries for Haagen Dasz ice cream, which is owned by Nestle Foods. Call Nestle, and tell them they are in violation of their principles of social responsibility. They need to tell Sakuma Farms the same thing - sit down with the workers. Sakuma Farms berries are sold under the Driscoll label. Driscoll needs to do the same thing - to tell Sakuma Farms to sit down and talk. Workers need your help NOW! If you can only make one call, please make this one. If you can make three more, call Haagen Dasz and Driscoll. Guest workers...offer something hiring a local worker does not: subservience. THE words “guest workers” and “strike” are not often seen together. Yet twice this summer, members of a group of more than 150 Jamaican guest workers who clean luxury Florida hotels and condos walked off the job. The workers came to the United States in April anticipating a summer of hard work and decent earnings to send home. Instead, they encountered the black hole of labor subcontracting. Labor-recruitment firms brought the workers from Jamaica to the Florida Panhandle. Cleaning contractors hired them and then leased them out to scrub toilets and sweep sand from floors for vacation property companies. In the United States, immigration of documented or undocumented individuals underlies the provision of interpreting services for persons who have limited proficiency in English. On May 12, 2008, the U.S. Immigration and Customs Enforcement agency carried out a raid on a meat packing plant in Postville, Iowa, that resulted on the arrest and deportation of 389 undocumented non-national workers. This raid was to be a pilot operation, a model, for future raids. As a court interpreter and human being, I cannot help to consider the Postville raid as a shameful episode in the treatment of immigrants in this country. Transgender individuals face a double whammy when it comes to being jailed in immigration detention centers, not only for being undocumented but also because their gender identity isn’t officially defined within the prison system, according to victims and activists. Ten immigrant justice activists, including one elderly nun, were arrested in New York City on Thursday in protest of the unprecedented detentions and deportations under the Obama administration. They also condemned the U.S. House of Representatives for its lack of action in passing a comprehensive immigration reform bill that would include a clear path to citizenship for the 11 million people living in the United States without U.S. residency papers. Who Really Benefits From Sweatshops? Consumers are ultimately the ones responsible for dangerous conditions in garment assembly plants in the Global South, Hong Kong-based business executive Bruce Rockowitz told the New York Times recently. The problem is that improved safety would raise the price of clothing, according to Rockowitz, who heads Li & Fung Limited, a sourcing company that hooks up retailers like Macy's and Kohl's with suppliers in low-wage countries like Bangladesh. "So far," he said, "consumers have just not been willing to accept higher costs." More than 25 years since the last major revision of national immigration policy, comprehensive reform is now being debated in Congress. Eleven million undocumented immigrants living and working in the U.S. hope it will lead to legal status, but many fear it will also increase the criminalization of migrant status and vastly expand "guest worker" contract labor programs. Now, in The Right to Stay Home: How US Policy Drives Mexican Migration, investigative reporter David Bacon exposes the way globalization and U.S. policy fuel the forces that drive Mexican migrants across the border. Through painstaking analysis and the voices of migrants themselves, Bacon reveals that the decision to come to the U.S. is rarely voluntary. Instead, the poverty that displaces indigenous communities across Mexico is the brutal consequence of globalization, as local economies crumble from the impact of trade agreements like NAFTA and economic reforms benefitting large corporations. Placing issues of displacement and human rights at the center of the U.S. immigration debate, Bacon examines the ways U.S. policy has criminalized migrants once they've been driven across the border. Bacon scrutinizes one of the most controversial pieces of U.S. immigration policy, vastly expanded in current legislation: guest worker visas. These visas grant the right to stay in the United States while working, but, he shows, lead to a corrupt system of recruitment and low wages, and the massive violation of labor and human rights.. Examining the roots of current systems in the Bracero Program, Bacon explains: "No employer brings guest workers into the country to pay more than absolutely necessary." Despite these impacts, though, every major immigration reform bill proposed over the past decade has called for the expansion of guest worker programs-including the legislation currently on the table. 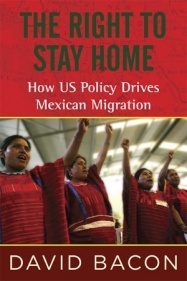 The book, however, also documents a reality that Bacon asserts should reframe the immigration debate in the U.S. Indigenous Mexican communities that have been devastated by poverty and forced migration have organized a powerful new movement they call "the right to stay home." He traces the development of this movement, which seeks political democracy and economic development, in the states of Oaxaca and Veracruz, and presents the voices of its most eloquent advocates. By looking at the roots of migration, U.S. policy can help to create a viable future in migrant-sending communities, while integrating and protecting the rights of immigrant families in the United States. * Low wages and rural poverty: Bacon explains that high-paying jobs are evaporating across Mexico, replaced by low-paying ones: 95 percent of the jobs created in Mexico in 2010 pay around $10 a day, he notes, and 53 million Mexicans (half of the country's population) lives in poverty. Since 2006, less than one third of those needing work have been able to find it. Bacon explains that waves of Mexico's economic reforms decontrolled prices and ended consumer subsidies, creating favorable conditions for corporate investment but increasing poverty, especially in rural and indigenous communities. * The North American Free Trade Agreement (NAFTA): Bacon shows that NAFTA, introduced in 1994, crippled Mexico's economic sovereignty and steered its national policy toward export-based economic development, favoring large corporations producing for export. At the same time, massive imports devastated local Mexican economies, especially in farming, displacing millions of people. Since 1994, the number of Mexicans living in the U.S. rose from 4.6 to over 12 million - 11% of its population. * Tilting the Playing Field Against Workers: Industries expanding in Mexico because of NAFTA and corporate economic reforms, especially mining, have created hazardous conditions. One 2006 coal mine explosion in Coahuila killed 65 miners. When copper miners struck against levels of dust that cause silicosis, the Mexican government and one of the world's largest mining companies cooperated to bust their union. The book analyzes three of the sharpest government anti-labor campaigns - the labor law reform, the firing of 44,000 electrical workers, and attacks on the miners. Bacon show that this systematic suppression of labor rights in Mexico is a significant cause of migration to the U.S.
Bacon underscores that Mexican migrants, once forced from their native lands, are then criminalized after they settle in the U.S - caught between two nations where they are denied basic rights. He traces the rise in criminalization of immigrants under President George W. Bush, especially the enormous spread of factory raids. Bacon then documents the continued criminalization of immigrants during President Barack Obama's first term in office, leading to the deportation of almost 400,000 people per year and the massive expansion of detention centers. The book focusses attention on one of the least visible parts of the administration's enforcement policy -- predatory I-9 audits and mass firings - the so-called "invisible raids." It documents as well the rise of new enforcement programs, like Secure Communities, that draw local law authorities into the hunt for immigrants, and the notorious "Operation Streamline" court in Tucson. Bacon does more than highlight abuses, however. He draws a connection between the increase in enforcement and the increase in guest worker programs, intended, in the words of former Secretary of Homeland Security Michael Chertoff, "close the back door and open the front door." This connection, Bacon says, is the driver of much of current U.S. immigration policy. Bacon says human rights,rather then criminalization or contract labor programs, should be the central issue in immigrant policy, a conclusion drawn from migrants' own words and experiences. In their narratives throughout the book, they envision a world in which migrating for work and survival isn't a forced necessity-a world where, instead, they have the "right to stay home." At the same time, they envision a world in which their rights as migrants are protected. "Migrants are human beings first, and their desire for community is as strong as the need to labor," Bacon writes. "Rather than reduce migrants to a factor of production, or a commodity to be exported and imported, migration policy must acknowledge migrants as human beings and address their dignity and human rights." Award-winning photojournalist and author David Bacon spent twenty years as a labor organizer. For the last two decades he has been a reporter and documentary photographer, and a longtime radio host. 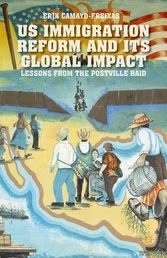 His previous books include The Children of NAFTA, Communities Without Borders, and Illegal People (Beacon, 2008). He is an associate editor at Pacific News Service and writes for TruthOut, the Nation, the American Prospect, the Progressive, and the San Francisco Chronicle, among other publications. As an immigrant rights activist he helped organize the Northern California Coalition for Immigrant Rights and the Labor Immigrant Organizers Network. He belongs to the Pacific Media Workers Guild/CWA. "David Bacon is the conscience of American journalism, an extraordinary social documentarian in the rugged humanist tradition of Dorothea Lange, Carey McWilliams and Ernesto Galarza." "Bacon's book... will help readers gain a significantly more sophisticated understanding of the context and on-the-ground reality of undocumented migrants in the U.S."
"Combining evocative personal narratives with penetrating geopolitical analysis, this compelling study vividly reveals the devastating effects on Mexico of the global class war of the past decades, and their impact on the United States. Perhaps the most striking demand of the victims is "the right to not migrate," the right to live with dignity and hope, bitterly attacked under the neoliberal version of globalization." "Americans mostly think of immigration in terms of its impact on the U.S., and progressives mostly think of the rights of immigrants when they are in the U.S. David Bacon's work reminds us that migration has a profound impact on the places migrants leave from, just as surely as it does on the places they go to. He argues persuasively that the right NOT to migrate cannot be divorced from the immigrant rights. The heart of David Bacon's whole body of work is in human stories, and this book validates its ideas with vivid testimony, in their own words, from those most affected." -- John W. Wilhelm, President Emeritus, UNITEHERE! "A must read for organizers,immigrant advocates,policy wonks and citizens who care about our history and values as a nation. This book puts a human face on the immigration debate, it's impact on people on both sides of the border, and the indispensable elements of real comprehensive immigration reform -- our understanding of how, why, who got us into this mess, and what we need to do to fix it." David Bacon speaks about The Right to Stay Home and the need for human and labor rights in U.S. immigration policy. Immigration forum with Assemblyman Luis Alejo, Democratic Dialogue Comm.